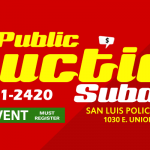 Beginning November 1st and running through the end of March, San Luis Police Department officers will be sporting a new look to support a worthy cause. The No-Shave November is a national movement that encourages men to raise awareness and funding for cancer-related charities, including the American Cancer Society, non-profit organizations related to domestic violence awareness and local youth organizations among others. Officers generally have to follow strict rules about facial hair, but these rules will be relaxed a bit this November and it will go through the end of March. Officers will be allowed to grow neatly trimmed beards and goatees, but will focus on keeping a professional image as they continue serving the community. Acting Chief of Police Richard Jessup adds, “As we in law enforcement support worthy causes, we encourage those in the community to help us bring awareness and raise much needed funds for these organizations”.